The high profile Wicklow TD is bowing out of talks to join the Independent alliance. HIGH PROFILE INDEPENDENT TD Stephen Donnelly has said he will not be joining the alliance of independent deputies being put together by Shane Ross and Roscommon/South Leitrim’s Michael Fitzmaurice. The Wicklow politician’s name has been linked with the grouping in the last week, after Ross and Fitzmaurice confirmed on RTÉ’s Prime Time that they were teaming up. “Recently, I have had conversations with TDs involved in the Independent Alliance to explore the possibilities for such a political movement,” Donnelly said in a statement. At this stage I have concluded that it is not something I will be joining. I believe all challenge to the stale cartel that is Irish politics is welcome, and I wish those involved luck in their endeavours. Ross said he was surprised by Donnelly’s decision, but thinks it was spurred by his dislike of the group not having a whip system in place. It was somewhat of a surprise because we went off together to Meath last Tuesday and we were talking to councillors and everything seemed to be going very, very well.I think maybe he thought it was going in a direction that was too loose for him, too radical for him maybe and he wishes to be part of something that is more disciplined, obviously. “I want to see something completely and utterly new in Irish politics … the whip loosened to as far as is humanly possible,” Ross stated. Finian McGrath, one of the TDs in the alliance, said he had ”no intention of joining a political party”. I want to work with my colleagues in an Independent alliance … The brand Independent has to remain, that’s what people are voting for. Ross denied he was setting up an alliance rather than a party to avoid new rules that mean having at least 30% female candidates at the next general election. No women TDs are on board yet but Ross said he “suspect[s] that we’re above the quota at the moment” due to the number of female councillors who want to join the alliance. So, where do other Independents stand? Donnelly’s decision today follows increasing speculation over who will and who won’t be joining the grouping. Michael Healy-Rae (above) thinks some of his peers are being “very presumptuous” by forming a group. Healy-Rae said politicians might be better placed to wait and see if they’re re-elected before deciding who they who they will or won’t work with. The Kerry TD said informal discussions about a potential alliance have been “going on a long time” at Leinster House, but he’s not too interested. Healy-Rae questioned why former Fine Gael junior minister Lucinda Creighton has ruled out running with certain parties before her new as-yet-unnamed party is fully up and running. She should leave her options open, that’s her business … On a personal basis, she’s trying something new so the blessings of God be in her. Dublin Central TD Maureen O’Sullivan agrees that “any sort of alliance is a bit presumptuous”. A. We don’t know when the election will be and B. We don’t know who will be elected. I think it’s putting the cart before the horse. O’Sullivan said she would have “no difficulty” listening to anyone from the alliance about their ideas but is “very hesitant to join”. Tipperary North TD Michael Lowry also has no plans to join the group. I have survived as an Independent since 1996 and intend to remain as an Independent … There’s a big flurry at the moment about Independents. My intention is to remain as I am. Donegal representative Thomas Pringle said he has had no discussions with Ross or Fitzmaurice about joining the alliance, but expects to do so soon as the Dáil resumes tomorrow. He said he would only be interested in joining the grouping if it was anti-water charges and focussed on “reversing the unfairness forced on people by Fine Gael, Labour and Fianna Fáil”. Pringle believes this can be done through reformation of the tax system and additional funding for education and health. Kildare North TD Catherine Murphy said she doesn’t think her views would merge well with those of the alliance’s members as she is “centre-left” while they are “more centre-right” in terms of the economy and social issues. Murphy added that she was “flexible about working with people in different types of formations” but would have to agree with them on issues “more than 50% of the time” in order to do so. 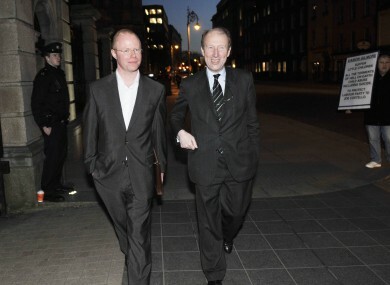 As for Creighton’s party, Murphy said it “wouldn’t be any surprise that we would probably be polar opposites”. TheJournal.ie also attempted to contact Róisín Shortall and Mick Wallace prior to publication. Analysis: Lucinda’s new party won’t be left, right or whipped, so how will that work? Email “Shane Ross: I want something completely and utterly new, Stephen Donnelly doesn't”. Feedback on “Shane Ross: I want something completely and utterly new, Stephen Donnelly doesn't”.